It’s before 8 am on a crisp Sydney morning, and Sister Anne Mayberry (right with her sister Elizabeth) is unloading her four-wheel drive at the front entrance of St Vincent’s Public Hospital in Darlinghurst. 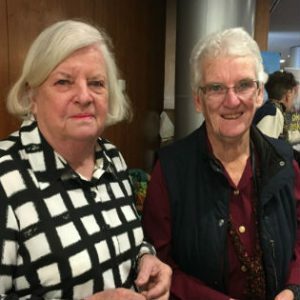 She is pulling out bags, boxes, and crates full of the goods she will soon – with her team of helpers including her twin sister Elizabeth and her cousin, Sr Margaret Valentine rsc – be selling in the foyer of the hospital. 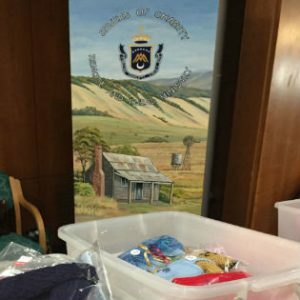 It’s another stall day at the hospital to support Sisters of Charity Community Care Limited’s Remote and Rural ministry. It’s controlled pandemonium inside during the bump in at first, a situation not helped when the cash float upends itself on the carpet behind the impromptu counters. “Theses stalls have been happening for 10 years now,”said Sr Anne. Sr Anne’s helpers have not yet finished setting up – the hand-made items such as the dolls and the teddy bears, the soaps, the blankets, and the scarves, along with a seemingly unending collection of donated books and DVDs are being put in place with practised skill – when the first customer appears and snaps up 15 DVDs. He pays, and disappears into the crowd which is starting to gather around. The focus of their initial attention – the home-made lemon curd, biscuits, pickles, rocky road, and marmalade. The marmalade! Thick cut, and made for the stall by Sr Maria Wheeler. People came and loaded up with the delicacies (only $4 a pop). The man with the DVDs came back and bought 10 more. “Nothing on tele these days,” he says, as he leaves for a second time. 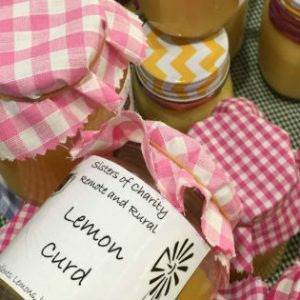 A woman who has been successfully treated for breast cancer at St Vincent’s gathered up curd, marmalade, biscuits, and moved down the counters to spend more to support Sr Anne’s Remote and Rural mission. “I know how to give back. It’s so important to give back,” she said, delighted to be both giving back and with her purchases. “Our customers are most generous often not wanting change or just give a donation,”said Sr Anne. Sr Anne’s stalls this year – one at St Joseph’s Auburn in July, and this one at St Vincent’s – raised $1,475 and $1,625 nett respectively. Quite a neat little pair of outings. The money raised goes to assist families in remote and rural communities doing it tough. 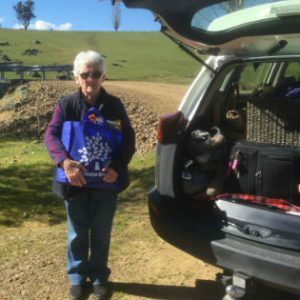 In late August, Sr Anne was off on a road trip to Melbourne, swinging through Young, Cootamundra, and Holbrook. Along the way, she called in at St Mary’s in Young where she dropped off some supplies, and was greeted by the Principal and the Deputy principal. Both of them were dressed as Shaun the Sheep (pictured below). assisting families with specialist fees, and providing for families struggling to meet gap expenses for medical services; A garden comp in Wilcannia to involve people working together in community; assisting students to atttend a representative sports carnival and participate in school excursions; helping an elderly man get his ute fixed; money to help with a confirmation celebration; registration fees for the Australian Catholic Youth Festival; assistance with fuels to attend funerals on country, family visits, and catering for relatives coming to funerals.